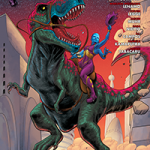 The Synthetics #1 Live on Kickstarter! Two Free Books! 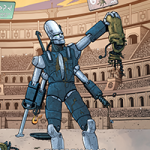 Our next comic, The Synthetics #1, is live on Kickstarter here! 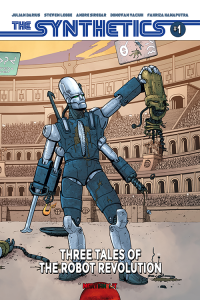 It takes place in the same Martian Universe in which Martian Comics is set, but features tales of robot life! We know it hasn’t been long since our Kickstarter campaign for Lazarus #1, but we wanted to participate in Kickstarter’s January “Make 100″ program. 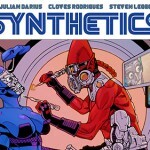 As part of this program, we’ll be printing up to 100 copies of The Synthetics #1! We don’t generally do printed single issues, but we’re making an exception because it sounded like a fun thing to do! 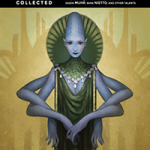 Best of all, anyone pledging in the Kickstarter’s first week will get two free books in PDF! The first is my huge magnum opus on the Justice League and the DC Universe, Classics on Infinite Earths. The second is my book on Mai, the Psychic Girl. Both will be sent free to anyone who pledges before the end of Tuesday, 23 January. You can read more details and scope out the new Kickstarter here. Tagged The Synthetics. Bookmark the permalink.